1-701-642-4000 Jenny Wolf, 91, Fargo, formerly Wahpeton, ND, passed away Tuesday, July 30, 2013 at the Broen Memorial Home, Fergus Falls, MN. The Funeral Mass will be Friday, August 2, 2013 at 10:30 a.m., at St. John's Catholic Church, Wahpeton. Visitation will be Thursday, from 5 PM to 7 PM with a 7 PM Prayer Vigil at Willow Creek Chapel, Wahpeton. There will be a Foresters Rosary, Friday morning at the church at 9:30 A.M. Interment will be at Calvary Cemetery, Wahpeton. Vertin-Munson Funeral Home is in charge of arrangements. Jenny A. Wolf was born November 12, 1921 to Louis and Anne (Ridl) Kubas on the family farm, near South Heart, ND. She grew up and attended the local country school. 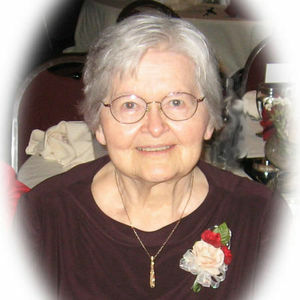 She married Anthony "Tony" Wolf on December 31, 1945 in Dickinson, ND. They lived in Beulah, ND, for the first 12 years of their marriage and moved to Wahpeton in 1958, where they raised their 7 children. Jenny worked as a nurse aide for 18 years at St. Francis Hospital, Breckenridge, MN and for 10 years at 3M, Wahpeton, until retiring at the age of 68. Tony passed away February 3, 1980. She moved to Fargo eight years ago to be near her children. In November 2012 she moved to the Broin Home. Her greatest job was that of mom, grandma and great-grandma. She loved baking, cooking and growing flowers. She also crocheted and embroidered. She enjoyed playing cards at the Senior Center in Wahpeton and with her grandchildren and great-grandchildren, usually beating them at the card game. Jenny is survived by her children, Leroy, Modesto, CA; Lance (Penny), Fargo, ND; Lynn (Jeanne) Mandan, ND; Lori, Fargo, ND; Leslie (Kathy), Fergus Falls, MN; Lou (Janice), Richmond, VA; and Lonette (Mike) Heiden, Fergus Falls, MN; 21 grandchildren, 17 great-grandchildren; her sister, Gladys (Lawrence) Hlebechuk, South Heart, ND; sisters-in-law, Liz Wolf, Dickinson, ND; Emily Wolf, Rochester, MN; and many nieces and nephews. She was preceded in death by her parents; her husband, Tony; grandson, Brad; great-grandson, Joel; four sisters: Sophie, Emma Ficek, Frances Fisher, Lillian Pavlish; and her brother, Joe Kubas. Memorials may be given to St. John's Catholic School or St. John's Catholic Church, Wahpeton. The beautiful and interactive Eternal Tribute tells Jenny's life story the way it deserves to be told in words, pictures and video. Thinking of you,Lynn. Although I never met your mom, I enjoyed our visits about her and hearing about all she meant to you and your siblings! I also enjoyed hearing my sister, Darlene, talk about the professional relationship she enjoyed with your mom at St. Frances Hospital in Breckenridge. She was indeed a credit to the staff there.